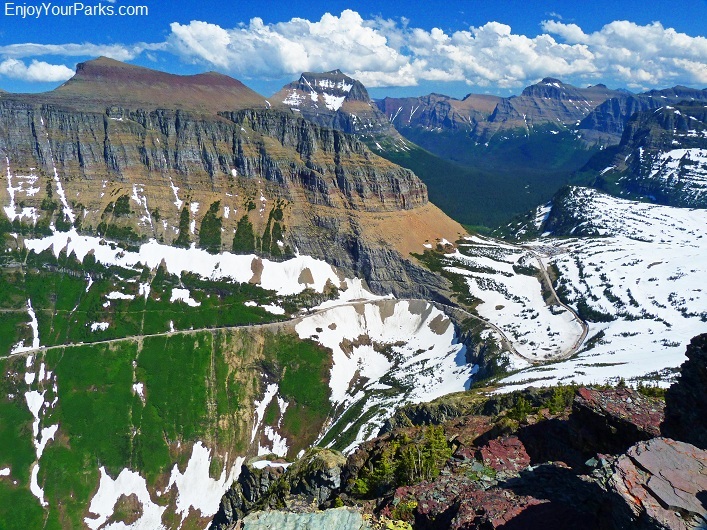 A view from the summit of Allen Mountain in Glacier National Park. Shannon enjoying the view from the summit of Reynolds Mountain. 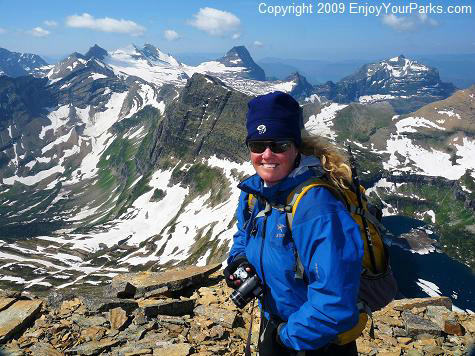 One of our favorite things to do is mountain climb in Glacier National Park. With over 200 named peaks, the climbing opportunities are endless. Their difficulty ranges from a simple scramble to class 6 technical nightmares. 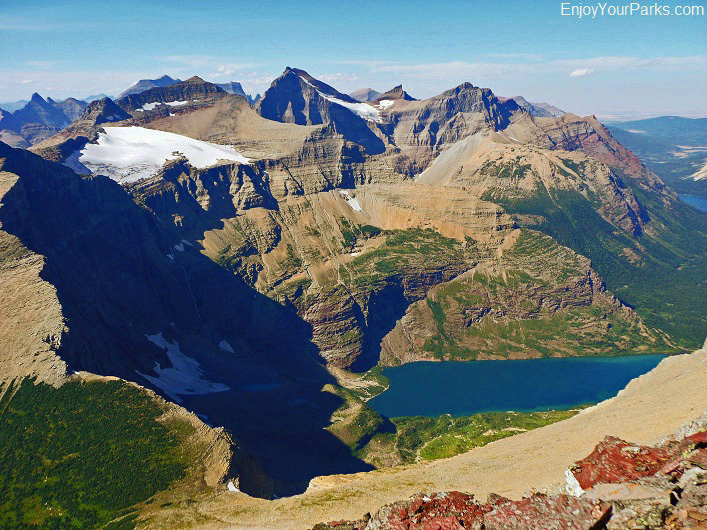 And what is so rewarding is the fact that the vertical expression (elevation from base to the summit) in Glacier Park is some of the most extreme in North America. For example, it is not uncommon to be standing on the edge of a 3,500 straight down cliff below your feet! In fact, some of the vertical walls on these peaks exceed 4,200 vertical feet, such as the famous North Face of Mount Siyeh in the Many Glacier Area, and the North Face of Mount Cleveland in the Goat Haunt Area. 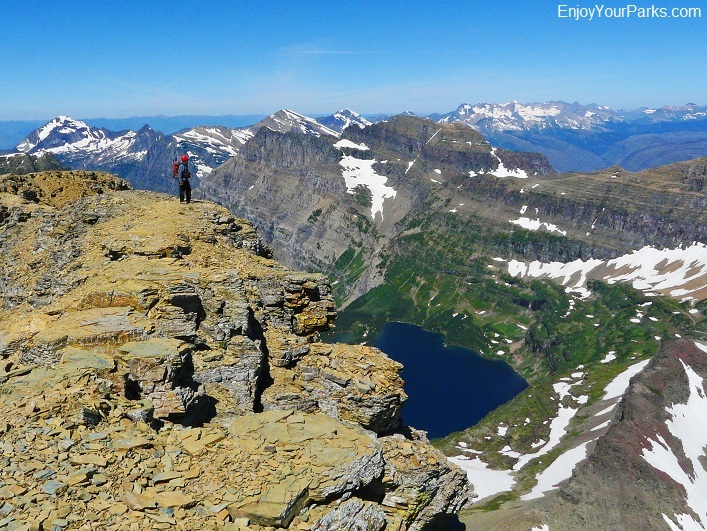 You are so high above the valley floors on these mountains that once you summit one of these giants and experience the feeling, you'll get completely hooked on climbing in Glacier National Park. 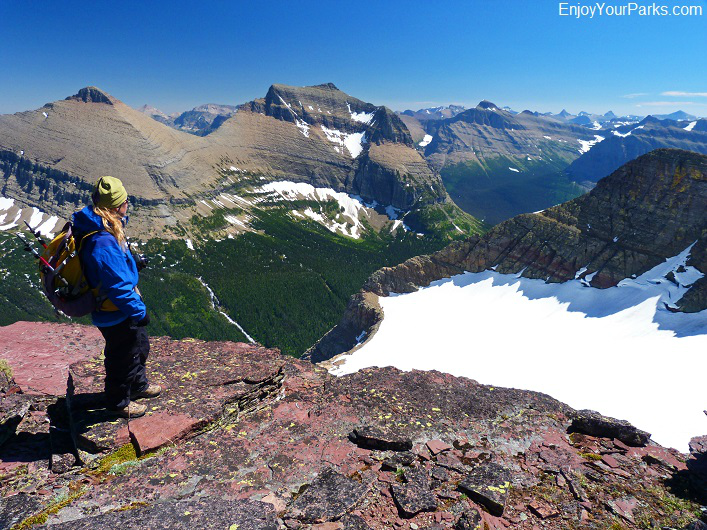 Climbing mountains in Glacier Park is one of our favorite things! 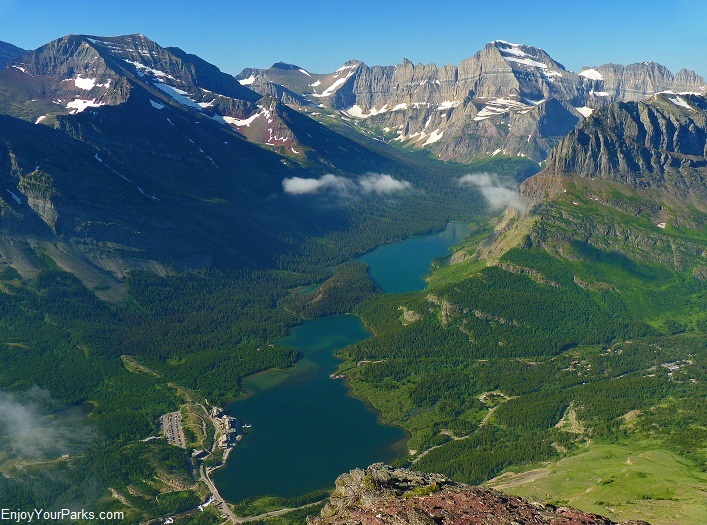 And because there are so many mountains in Glacier National Park, and because many of them are so remote that it take literally days to even get to their base, it would take 3 lifetimes to climb them all. 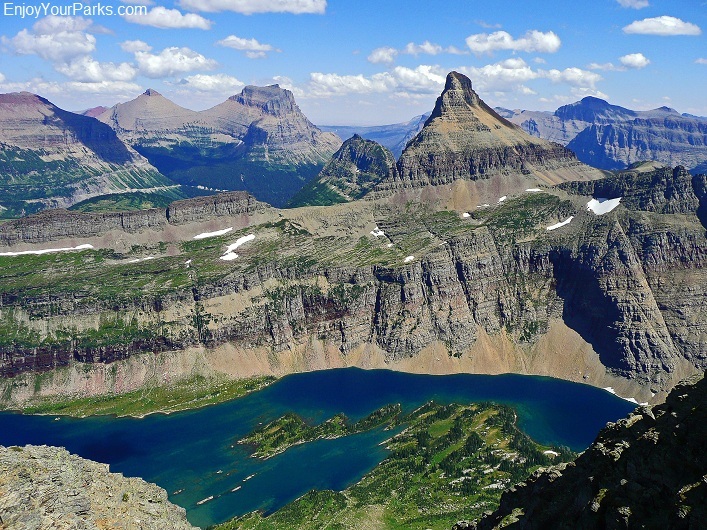 Glacier Park is so vast, rugged and seemingly infinite, that you will never run out of peaks to climb and places to discover in this incredible National Park. Regardless of the difficulty, once you make it to the summit of one of these impressive mountains, the views are so spectacular that you can't even begin to describe it. 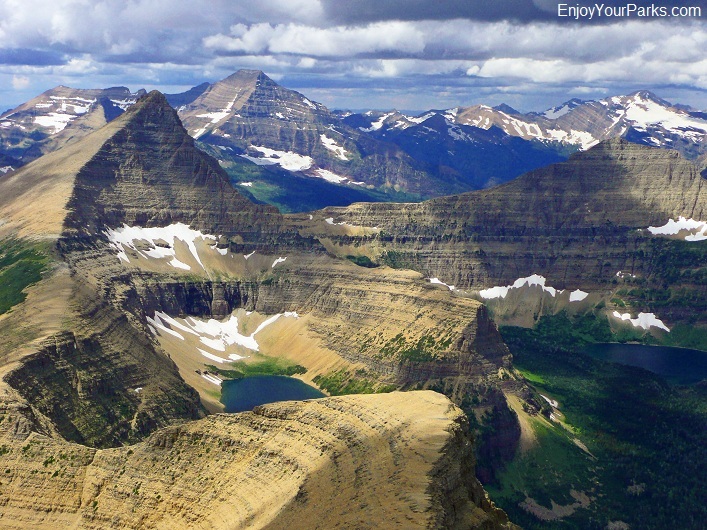 As we have said many times, we feel that Glacier Park is where Heaven and Earth touch, and being on a mountain top in this beautiful place will change your life forever. There is no other feeling like it! All of our climbs in Glacier Park are un-assisted. This means that we (Dave and Shannon) were the only ones participating in the climb, and the only "help" we ever receive is from a 30 year old iconic guide book. We love the challenge of finding the route by ourselves... because it's just us and the mountain. There's nothing more rewarding than "figuring it out" without any help other than a well written paragraph describing the route. Now of course everyone's different and everyone climbs for different reasons and there is no right or wrong, but one of the main reasons we climb is for the challenge of finding the routes (that are usually hiding in an ocean of cliffs) that allow us to reach the summits of these great mountains. Besides the challenge of "figuring out the mountain", the other reason we climb is for the incredible views these mountains provide us as we stand on their summits.... and that's what we want to share with you in this section of our website. We have no specific goals as to how many mountains we eventually want to climb, or for that matter which mountains we want to climb. 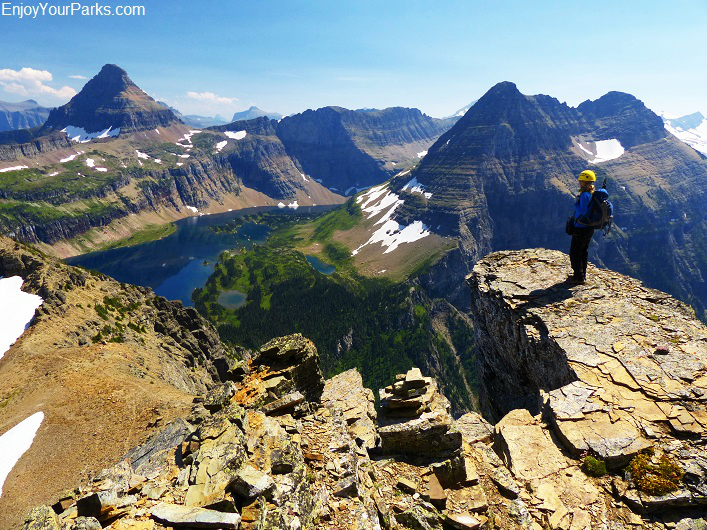 We simply love climbing mountains in Glacier Park and that's really the bottom line. 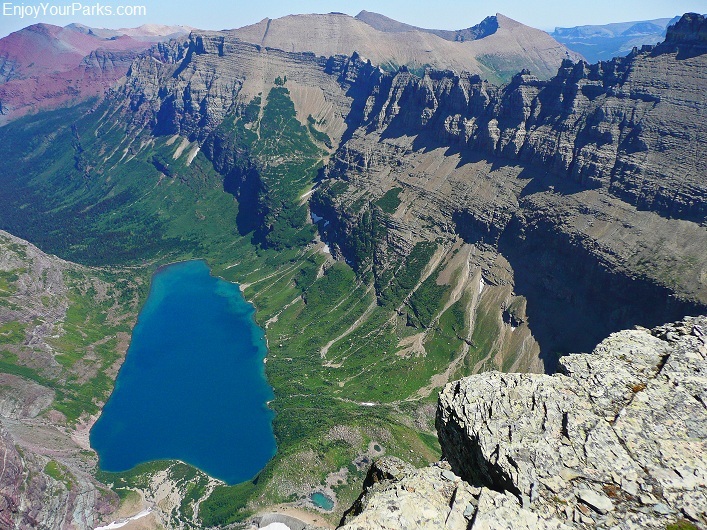 Another reason we may choose a particular mountain is that we know it will give us great shots of a particular trail far below us that will help hikers on our "Glacier Park Hikes" page to better understand where that particular trail is located with respect to the surrounding area. And you will see "route B" or "route C" after some of the peaks we've climbed. If we climb a peak more than once, we really try finding another route to the summit for the second ascent. It's super challenging at times, and it allows us to show our viewers more summit views of that particular peak on a different day, perhaps earlier or later in the season. So if we climb a peak a second or third time and use a different route, we'll provide a separate page for each of these climbs. This section is not a climber's guide. We've been asked by many viewers to include climbing routes to show them how we climbed each peak. We have chosen not to make a "climber's guide" at this time. We'll leave that to the iconic masters such as J. Gordon Edwards. Instead, we simply want to share with you the amazing views that we see on the summits of these great mountains. However, with over a 100 Glacier Park summits under our belts, we have learned a few things about climbing in Glacier Park. 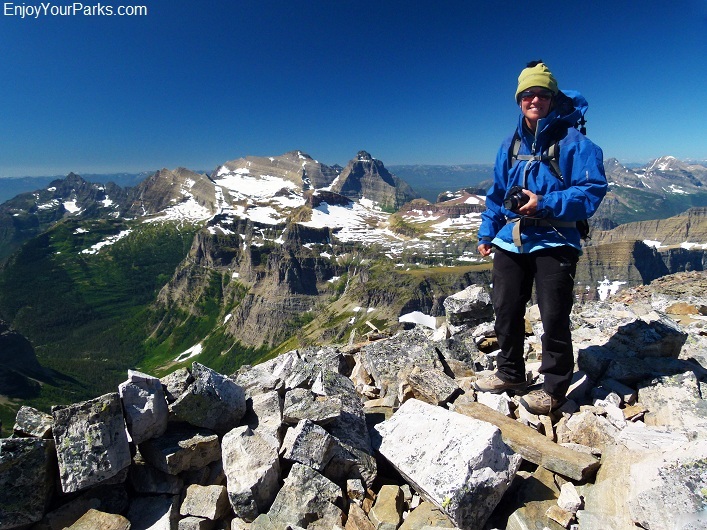 So for some of our basic tips for mountain climbing in Glacier National Park, click here. We will constantly be updating this page with more peaks and more views from the summits, so keep checking! 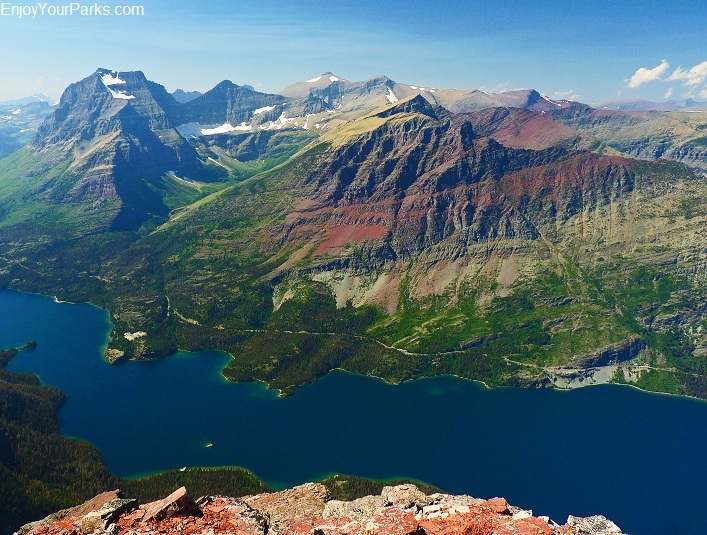 A view from the summit of Mount Siyeh in Glacier National Park. "Vertical Expression" is the amount of elevation from the base of a mountain to it's summit. It's really what gives a mountain it's size, and this is what makes the elevation of Glacier National Park's mountains so deceiving. 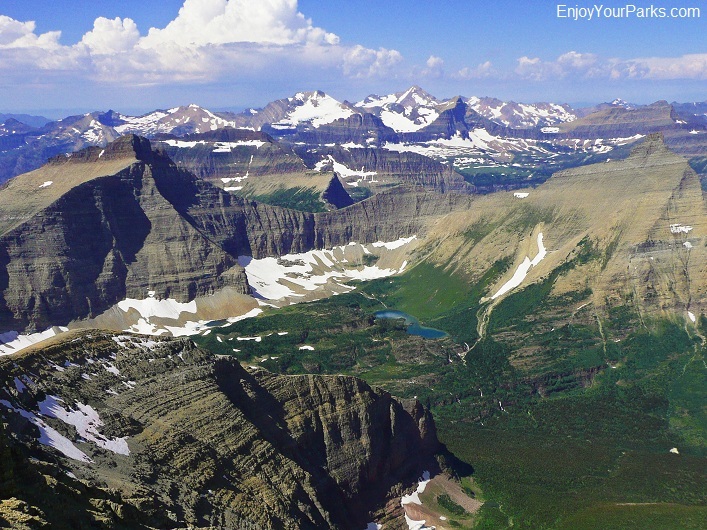 The valleys of Glacier Park are extremely low. For example, Lake McDonald is only 3,000 feet in elevation, which means the mountains of Glacier Park rise between 5,000 to 7,000+ feet above the valley floor. This amount of vertical rise is INCREDIBLE! In other certain areas of the rockies, the base of the mountains literally start at 7,000 to 9,000 feet. For example, Yellowstone Lake in Yellowstone National Park is 7,733 feet high! (whereas Lake McDonald in Glacier Park is only 3,000 feet high). At Yellowstone Lake, perceptually you don't feel that you are at all "high" because this elevation is the "base" of the surrounding mountains. In fact, standing on the shore of Yellowstone Lake gives you no feeling of being high whatsoever. And the mountains surrounding the lake are over ten thousand feet, but they don't look that high. This is because their base starts at 7,733 feet, so their vertical expression is only 2,300 feet! Grand Teton National Park has similar amounts of vertical expression as Glacier Park. However, the valley floor of the Teton Mountain Range is about 6,800 feet, whereas the valley floor of Glacier Park is only between 3,000 and 4,000 feet. So that is why Grand Teton Peak is nearly 14,000 feet high, whereas Mount Stimson in Glacier National Park is about 10,200 feet tall. These peaks have similar vertical expressions, but they start at different elevations. And even though it seems you're on top of the world when standing on Logan Pass on the Going-to-the-Sun Road in Glacier Park at 6,640 feet, you're not even as high as the valley floor in Grand Teton National Park. These parks have a totally different "starting point". So the bottom line is this: it's not the over-all elevation that makes a mountain range seem high, it's the amount of vertical elevation between the valley and its summits. A view from the summit of Flinsch Peak in the Two Medicine Area. A view of St. Mary Lake from Red Eagle Peak in Glacier National Park. Reynolds Mountain summit view, Glacier National Park. 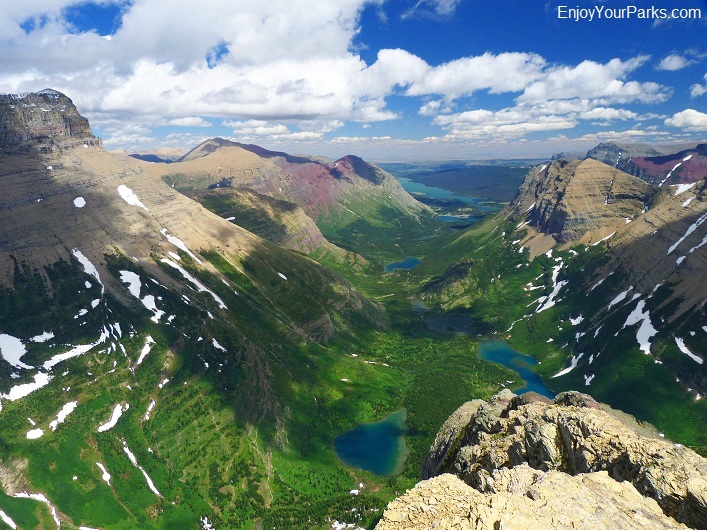 The bottom line is this: VERTICAL EXPRESSION is what makes the dramatic appearance of a mountain, and Glacier National Park has some of the largest vertical expressions in North America! To give you an example, the north face of Mount Siyeh is a cliff that's over 4,200 feet tall! This is one of the largest walls in North America, and is over a thousand feet higher than El Cap and Half Dome in Yosemite. Another example is the 10,142 foot Mount Stimson. No matter how you approach this mountain, the vertical expression is 6,000+ feet from it's base on Nyack Creek. This is similar to the vertical expression of Grand Teton Peak in Grand Teton National Park. Now if you "moved" Mount Stimson to Yellowstone National Park, this peak would have an elevation of over 14,500 feet! 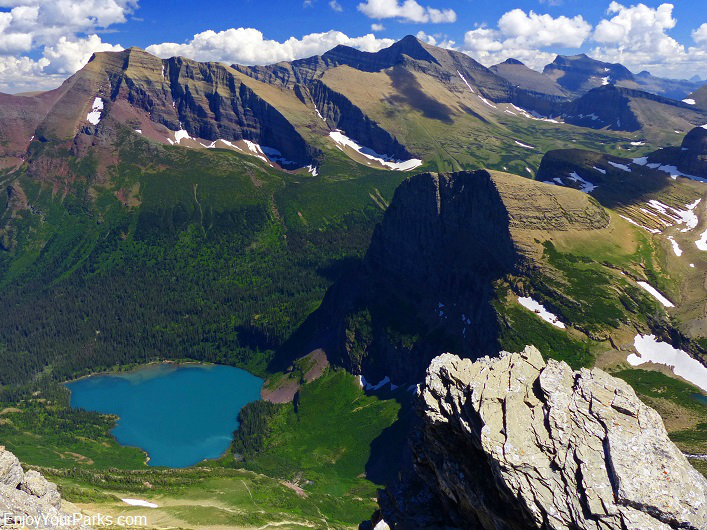 In fact, if all of the mountains of Glacier Park were moved to Yellowstone, they'd average between 12,000 and 14,800 feet tall! So again, it's the size of the mountain from it's base to it's summit that truly makes a mountain, not necessarily it's overall elevation. 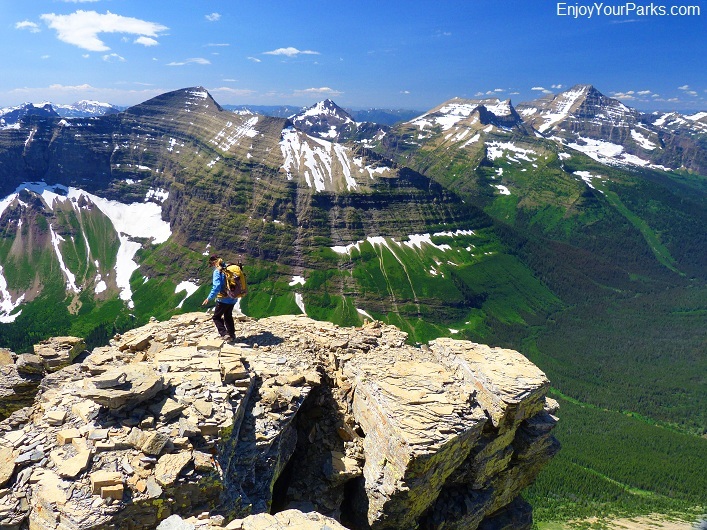 So when you are climbing in Glacier Park, you are enjoying some of the largest vertical expressions in all of North America, so the feeling of "being really high" is incredible, and the views from these summits are awe-inspiring to say the least. Shannon on the summit of Mount Chapman, with Kintla and Kinnerly Peaks in the background. Reynolds Mountain summit view of the Hidden Lake Area, Glacier National Park. The rock in Glacier Park is ancient. In fact, it's some of the oldest exposed rock on earth. Glacier Park's rock is over a billion years old, and it's sedimentary in composition. This means that even though it's strong, and able to create some of the largest vertical walls in North America, it is difficult to secure anchors for rope safety due to the lack of cracks. Whereas granite usually has nice solid cracks throughout it where you can securely place a cam or a nut, there are no such cracks in Glacier's sedimentary rock. So the only way to anchor is to pound a permanent piton (stake) into the rock. This is the only way class 5 and 6 walls can be climbed in Glacier National Park. Now of course pounding in permanent pitons (stakes) every time you climb class 4 pitches is not only impractical, but it also creates too much "litter" as well. So the way these pitches are climbed are WITHOUT ANY PROTECTION! This is because there is no way to anchor for belaying. And as any climber knows, if the belayer isn't anchored, then both of you could end up tumbling down the mountain. 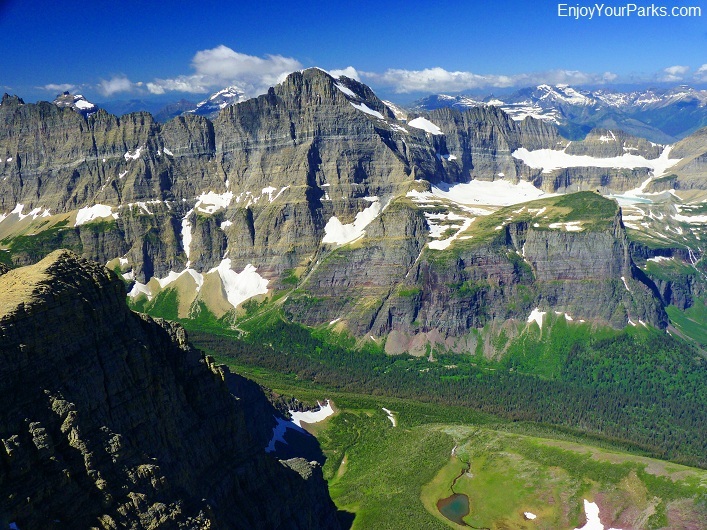 Therefore, the art of climbing Glacier Park mountains is finding a reasonably safe route among the cliffs. As far as Shannon and myself are concerned, we will not climb a pitch beyond a class 4+ because we are not protected, and a fall would be fatal. (Actually, a fall on a class 4+ would be devastating as well, so our rule is this: If we do not have solid holds with each move, we don't do it.) The bottom line in any situation is DON'T FALL! Falling is not an option, so we make sure that our hand-holds and foot-holds are secure. Now because of the inability to safely anchor, rappelling is usually not a good option either. This is very important to note, because let's face it- it's much easier to climb UP rather than climbing DOWN. And this is where a lot of people get into trouble. 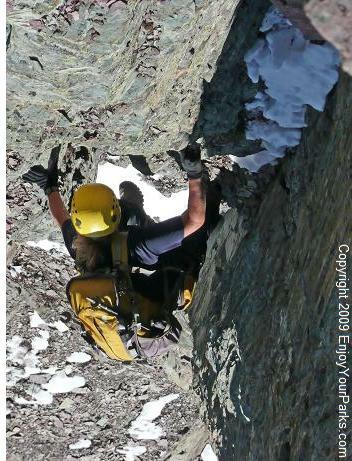 They will climb a class 4 pitch with no problems, but when it's time to climb down that pitch, it may be virtually impossible, depending on the situation. And since you can't rappel down, you are in really, really big trouble. So the bottom line is this: NEVER CLIMB UP A PITCH THAT YOU CAN'T CLIMB DOWN! climbing up what's known as a "Class 4" pitch. The photo to the left is a series of class 3 pitches all the way to the top. 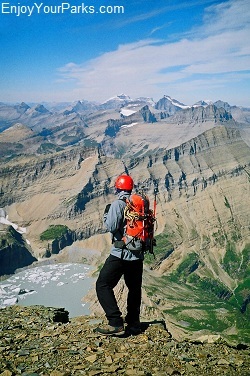 On really difficult pitches, we will remove our backpacks before we begin to climb it. I will climb the pitch, bringing a 50 foot rope with me. This rope has a locking biner on each end of it. When I reach the top of the pitch, I will then lower the rope, and Shannon will attach a backpack to it. Once I have pulled this pack up, I'll send the rope down again for the other pack. We will repeat this technique on the way back down. We have found that we have far more control on certain pitches without a heavy day pack throwing us off balance. And in some cases, if we are working our way up a very narrow gap or a chimney, there is not enough room for both the climber and the backpack! The climbing quality in Glacier is outstanding. In fact, the geology of the rock is nearly identical to much of the European Alps. The famous North Face of Eigerwand is virtually identical in rock type as many of the walls in Glacier, such as the North Face of Mount Siyeh, or the East Face of Mount Gould. 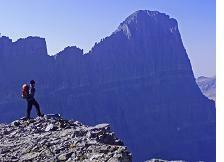 We love climbing in Glacier National Park, whether the peak is easy to climb or extremely difficult. The views on top of these incredible mountains never disappoint us, and we find that it's extremely challenging to find a safe route hidden in an ocean of cliffs. It's like solving a difficult puzzle or mathematical equation, and it is extremely satisfying. 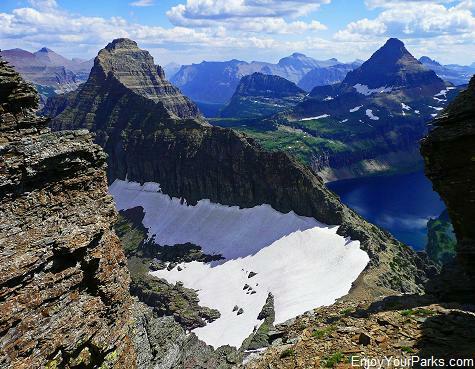 The bottom line is this: there's no such thing as a bad day when we're mountain climbing in Glacier National Park! Our goal in this section is NOT to show you the routes, or show you where or how to climb these peaks. Instead, we simply want to show you the magnificent views from the summits of these great mountains. So click on the above list of peaks at the top of the page, and enjoy the view!!! 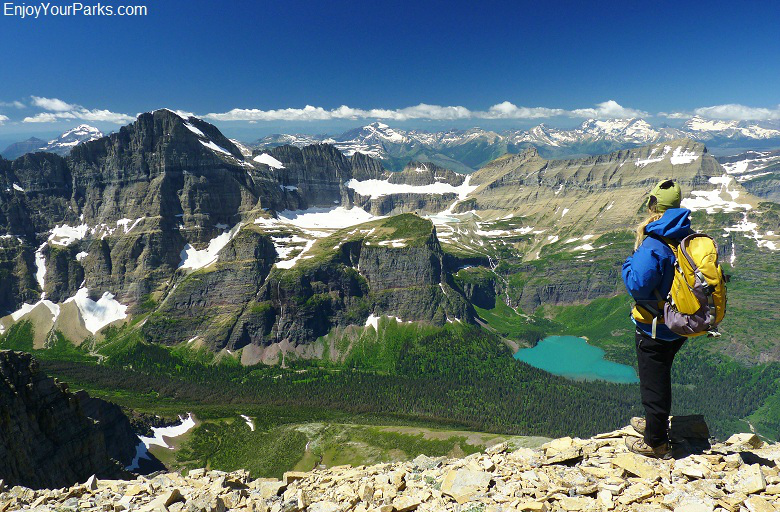 Summit view from Grinnell Mountain, with Grinnell Lake below, Glacier National Park. 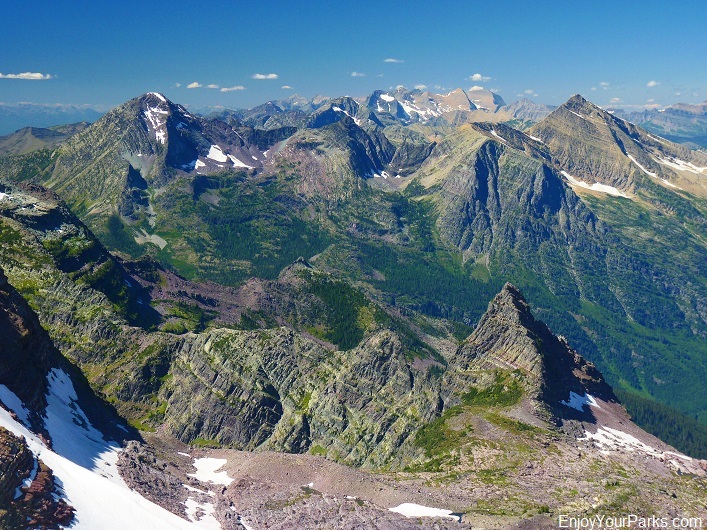 A view of Glacier Park's remote Livingston Range from the summit of Gunsight Mountain. 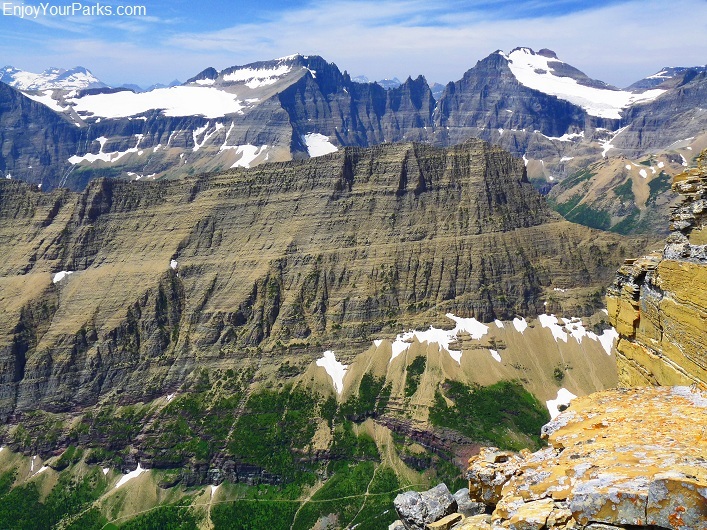 Summit view from Piegan Mountain with Piegan Glacier below, Glacier National Park. 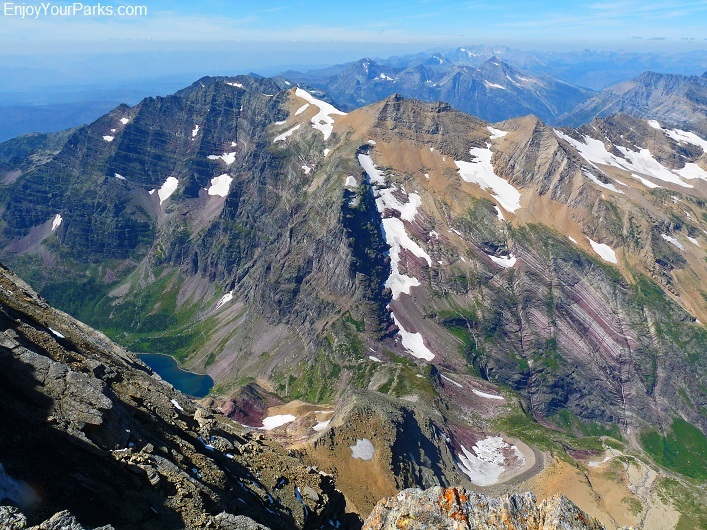 A view of Logan Pass from the summit of Mount Oberlin. A view from the summit of Bearhat Mountain, Logan Pass Area, Glacier National Park. A view from the summit of Rising Wolf Mountain, Two Medicine Area, Glacier National Park. View from the summit of Reynolds Mountain, Logan Pass Area, Glacier National Park. 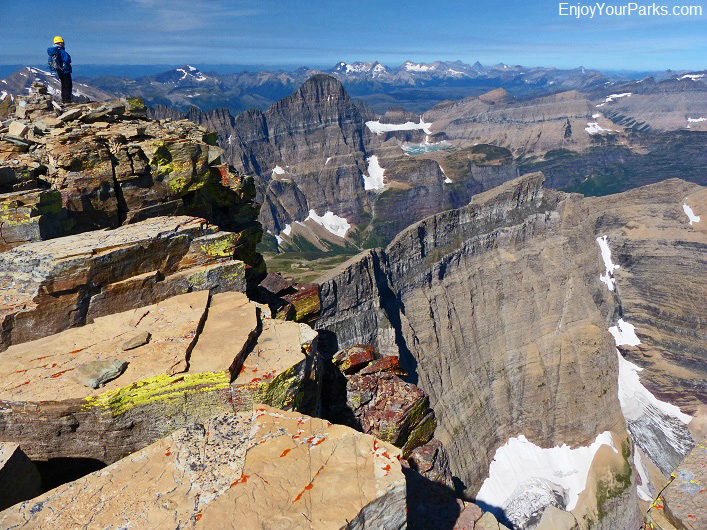 A view of the Kintla Peak Area from the summit of Boulder Peak, Glacier National Park. A view from Cannon Mountain in Glacier National Park. 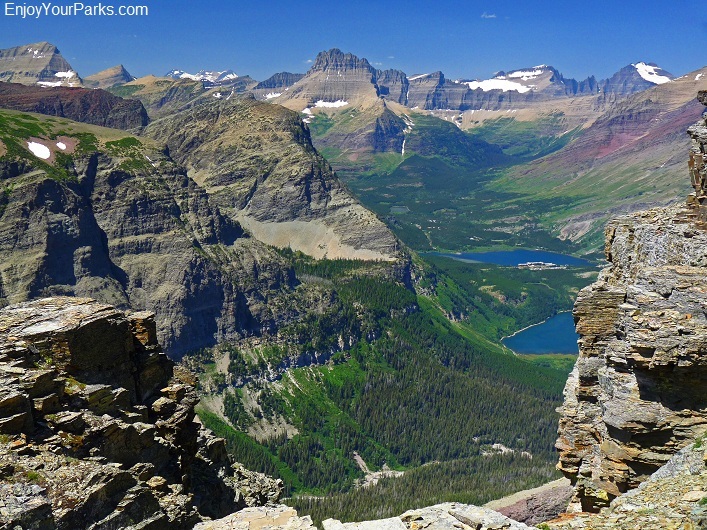 View from the summit of Mount Kipp, Glacier National Park. View from the summit of Iceberg Peak, Glacier National Park. A view of Mount Gould and Grinnell Glacier from the summit of Allen Mountain, Glacier National Park. 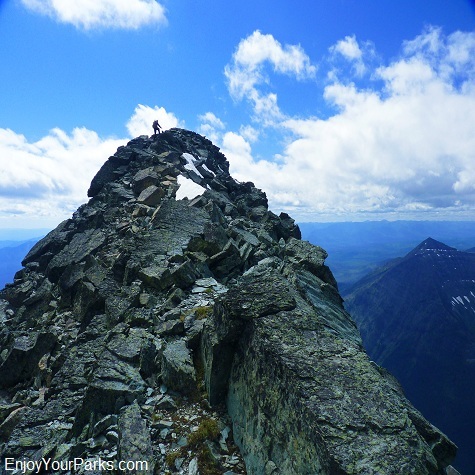 View of Gunsight Mountain from the summit of Mount Jackson, Glacier National Park. 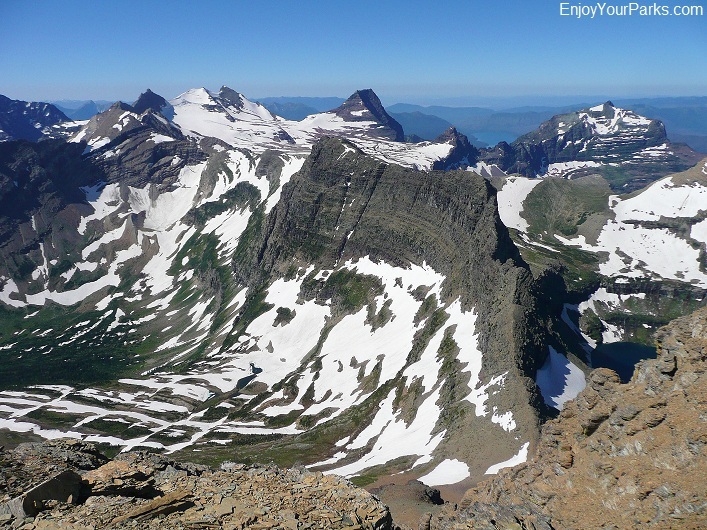 View of the Many Glacier Area from Mount Wynn, Glacier National Park. 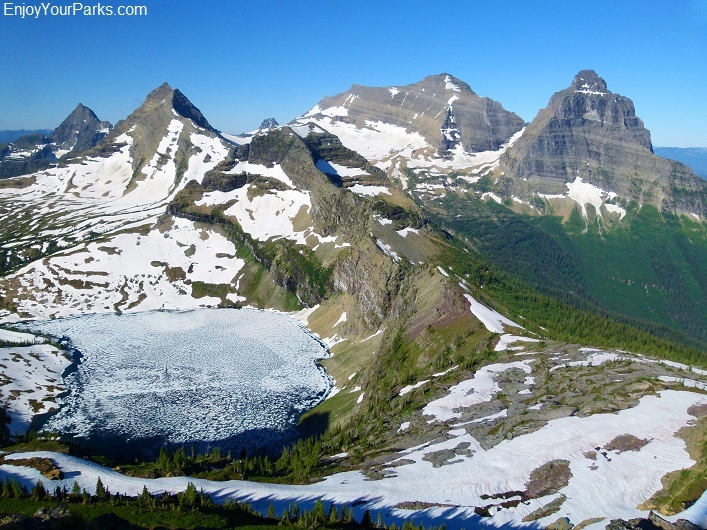 A view of Jackson Glacier from the summit of Mount Jackson, Glacier National Park. 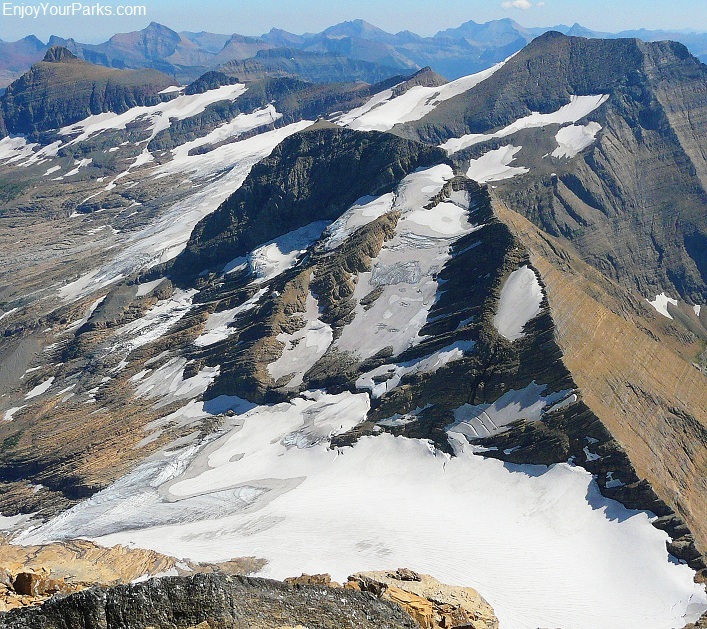 View of Ahern Glacier (left) & Old Sun Glacier (right) from the summit of Crowfeet Mountain. View of Clements Mountain and the Hidden Lake Area from Cannon Mountain, Glacier National Park. 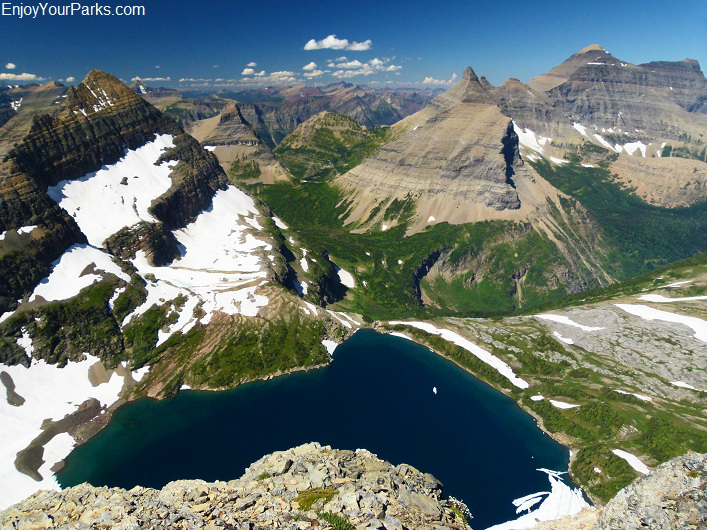 A view of Lake Helen from the summit of Ahern Peak, Glacier National Park. 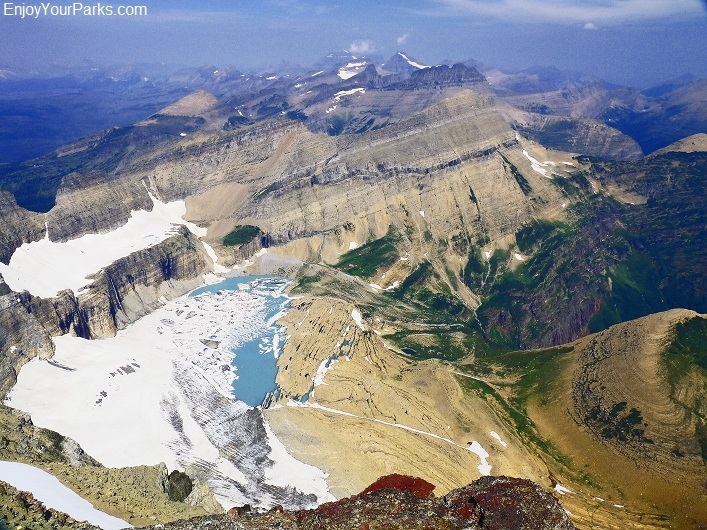 A view of Grinnell Glacier from the summit of Mount Gould, Glacier National Park. 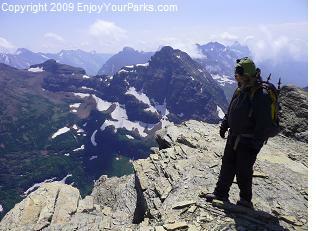 A great view from the summit of Mount James in the Cutbank Area of Glacier National Park. Altyn Peak summit view of the Many Glacier Area, Glacier National Park. 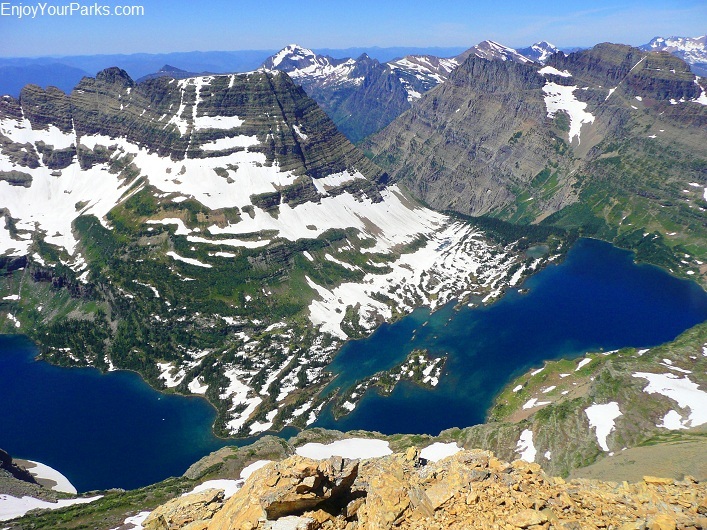 This is a view of the Many Glacier Area from the summit of Swiftcurrent Mountain in Glacier Park. go to the Top of the Page and PICK YOUR PEAK!